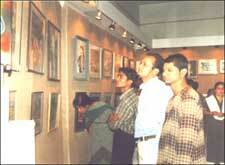 Kriya - A Group Exhibition Of Paintings is an event that took place between 02-Apr-2006 and 20-Apr-2006 in Hyderabad. The art mart is in a hustle-bustle for abstract pieces. Kriya denotes just these sort of compositions - art abstracted from daily life. The display of artwork exhibits individual perceptions of each artist. For participating artists like L N V Srinivas and Konda Srinivas, metascapes and urban demographic patterns are apt subjects for their canvasses. Some of the other artists visible are Ratin Kanji, Neha Vedpathak, Huma Faiz, Archana Yadav and Hukumlal Verma. The dominant medium is acrylic on canvas and paper. Each of these artists subscribes to a unique philosophy. Their work is based primarily on distinct aesthetic world-views. So don't feel perplexed if things fog up. Mystification is the prerogative of abstract art. Please contact 5561-8628, 98499-87187 for further details. Be the first to comment on Kriya - A Group Exhibition Of Paintings! Just use the simple form below. fullhyd.com has 700,000+ monthly visits. Tell Hyderabad what you feel about Kriya - A Group Exhibition Of Paintings!